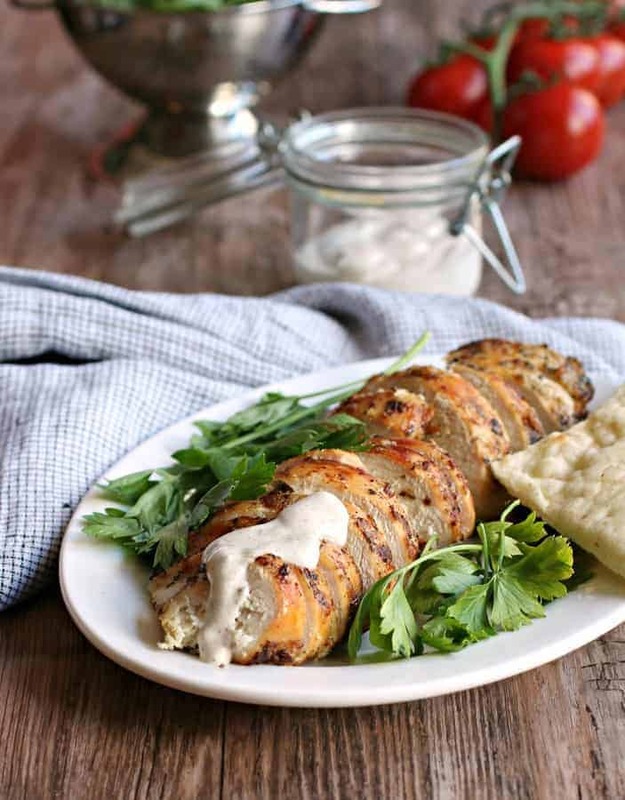 This is my new favorite Paleo baked lemon butter chicken recipe. I love how I can do anything while this Paleo baked lemon butter chicken bakes and how it makes a delicious lemon butter sauce right in the pan. It gets such a wonderful, deep flavor from browning the chicken in brown butter and then those yummy bits from the bottom of the pan. Once it’s in the oven, you have plenty of time to make a side or dessert while you breathe delicious smells from the oven. You may even want to use this as an excuse to buy a dutch oven pan like this one I used because it’s so nice to be able to move the pan straight from the stovetop to the oven. I also used the pan on this recipe, so once you try both of these recipes in a good cast iron skillet, you’ll see why it’s worth the money. Plus, you’ll just have to make this recipe part of your normal rotation because you’ll crave it! I love how all the ingredients in this dish are things most people keep on hand, except maybe the coconut milk. I guess just because I have several boxes of coconut milk in my house, doesn’t mean everyone does. However, if you don’t have coconut milk, you could sub heavy cream or half and half and it should work fine too. 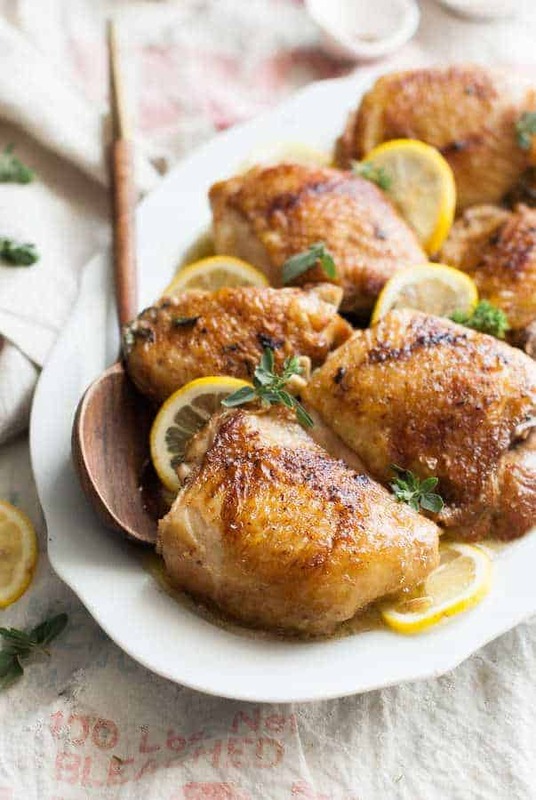 I actually came up with this Paleo baked lemon butter chicken recipe while on a family vacation in a little kitchen and I had only brought a few ingredients with me, so I put everything I had in a pan and it was this huge hit. I love how this makes it’s own sauce that you can use to put over a side dish, like rice, mashed potatoes, etc. You could even add a little thickener and make some lemon gravy if you want. Sometimes I add a little squirt of mustard to this dish and it gives it a subtle kick. Parmesan cheese would be good sprinkled over the top (if you don’t do Paleo) and you could also add some veggies, like onions, peppers, zucchini, summer squash or mushrooms and I bet that would be delish too. Or if you don’t like soggy vegetables, roast your veggies separately in the oven at the same time so they are crispy and you could still use the veggies to sop up the lemon sauce. I haven’t tried it myself, but I’m sure chicken breasts would work ok too. I prefer chicken thighs because the skin is so good and chicken thighs don’t dry out, but chicken breasts would work fine. Just keep an eye on them at the end because they easily overcook. 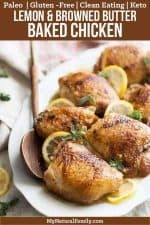 I would love to learn how you adapt this Paleo baked lemon butter chicken recipe, so please comment below so others will know what to try. I love how I can do anything while this bakes and how it makes a delicious lemon butter sauce right in the pan. Preheat the oven to 350 degrees. Heat a ceramic coated dutch oven over medium/high heat. Add the butter and melt. Sprinkle salt and pepper over both sides of the chicken. Add the chicken to the hot butter, skin side down. Let chicken cook for a few minutes, until a deep, golden brown. Flip chicken over and brown the other side as well. Remove the chicken thighs from the pan and set aside. Add the garlic and oregano and sauté for 30 seconds. Pour in the chicken broth and lemon juice. Bring to a boil and stir for one minute to deglaze the pan. Add the chicken thighs back into the pan and pour the coconut milk over the top. Bring to a boil and turn off the stove. Place the dutch oven in the preheated oven and bake for an additional 50-60 minutes. Chicken skin should be crispy and meat tender when chicken is done. Place chicken on a platter. Taste the sauce and add more salt, if needed. 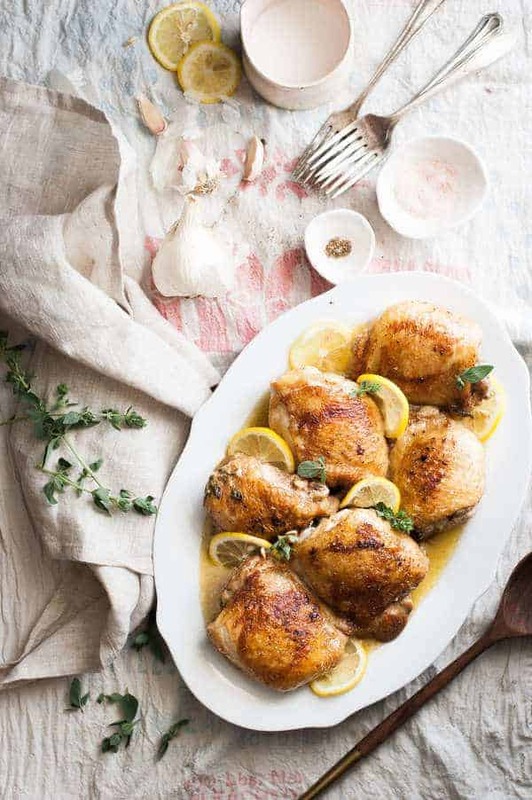 Pour sauce over chicken and garnish with fresh oregano and lemon slices. I made this for my husband and he liked it. There’s a lot to be said for that because he’s like the pickiest eater in the world. I’m new to a dairy-free diet (due to nursing a very gassy baby). I see this has butter in it and doesn’t mention a substitute. How would this be dairy-free? Love your site and your recipes look delicious! Oops. I totally missed that. You should totally be able to use avocado oil or an other oil of your choice in place of the butter. It won’t be quite the same, but it will still be good. And if you haven’t tried coconut milk in a savory dish, it’s life-changing on a dairy-free diet. I shouldn’t miss things like that. I ate dairy-free for about five years. Duh.